The Sandos Playacar Beach Resort is a tranquil oasis located on one of the most beautiful stretches of beach on the Riviera Maya, in Playa del Carmen. 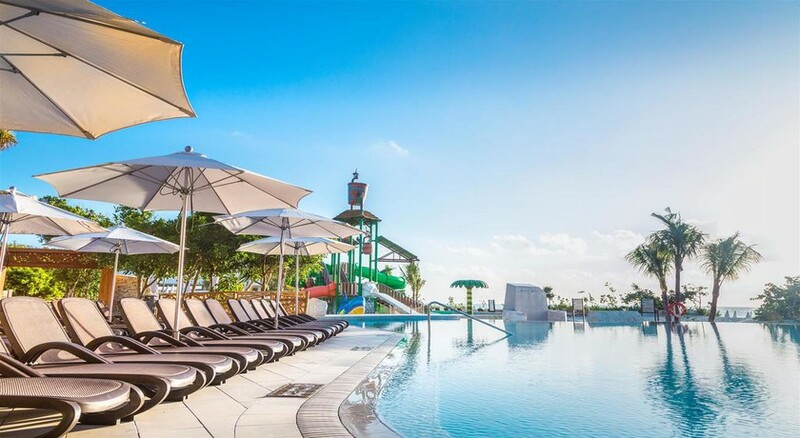 This all inclusive property caters for everyone, from its adults only Select Club for those seeking a serene stay by the Caribbean Sea, to the whacky Kids Club offering round-the-clock fun. The hotel's extensive range of swimming pools make for a splash-tastic stay, with three outdoor pools, four kids' pools and an adults only pool, too. The fun doesn't stop there, with countless recreational activities on offer including a boutique spa, golf course, cooking and dance lessons, beach and watersports, two full-size tennis courts, PADI diving courses, in-house evening entertainment and more. 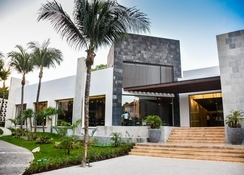 Sandos Playacar Beach Resort also features a plethora of restaurants, cafes and bars where guests can indulge in worldwide cuisine and refreshing cocktails. 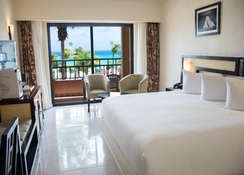 The hotel's guest rooms and suites tailored to everyone from couples to families – plus the new Sandos Palm Bay section introducing a private hotel entrance, lobby and suites on the beachfront. 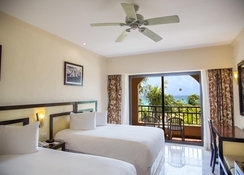 This all inclusive Sandos Playacar Beach Resort is a luxurious complex located on the white-sand beach of Playa del Carmen, one of the largest and most beautiful stretches on the Riviera Maya. In addition to its beachfront location, this 4-star hotel is close to the top tourist attractions including Cancun's iconic nightlife spots and the lush Playacar golf course. 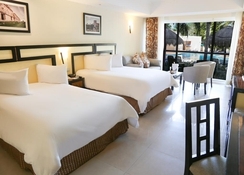 Sandos Playacar Beach Resort offers a variety of different room types across five sections of the beachfront hotel, to suit all guests. Choose from the new Sandos Palm Bay, Beach Section, Royal Elite Hacienda Section, Select Club Adults Only, and a Family Section. All rooms are spacious, comfortable and colourful, designed with quality amenities such as air conditioning, a safe box, mini bar, en-suite bathroom, hydro-massage bath, hairdryer, bath amenities, telephone, TV with satellite, electric kettle, sofa bed and WiFi internet. 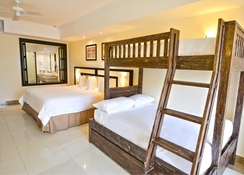 Each room also comes with a private balcony and room service is available on request. The hotel's wide variety of restaurants and bars are sure to impress, with two buffet-style restaurants, seven a la carte venues, three snack bars and five bars and clubs to indulge in on-site. Head over to the Riviera Grand Buffet for the best of International cuisine, Le Gourmet for exquisite French dishes, Asiana for delicious Asian plates, Chayita for Mexican cuisine, Fogo De Janeiro for Brazilian and Il Piemonte for Italian. Or stick to what you know and head to famous chain-restaurant El Gaucho, an Argentinean-style venue serving excellent South American steaks. The hotel bars include Blue Moon, La Plaza Bar and the Riviera Lobby Bars. 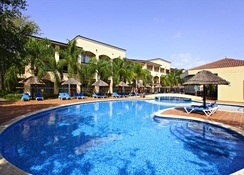 Sandos Playacar Beach Resort features five pools for adults and one for kids. Both are fitted with loungers, recliners and parasols. Guests between 4 – 12 years can join the mini club, where they can enjoy various activities organised by the hotel staff. Guests of the hotel can also participate in yoga sessions, Pilates (beginner class), sensory wine tasting, climbing/rock wall, sailing & kayaking in the lake, and Sandos San Blas hotel naturalist activities. Recreational activities also include aqua gym, basketball, beach volleyball, pool volleyball, table tennis, pool basketball, sports circuits, swimming, water polo, and of course golf (with 45 holes) — there is daily and nightly entertainment. And in case you need some time for yourself, do visit the plush spa to rewind and rejuvenate. *** Dress Code in the restaurants is casual elegance. *** Guests below 16 years need parental guidance to participate in some games. *** Babysitting, currency exchange, laundry and medical services are available on request.